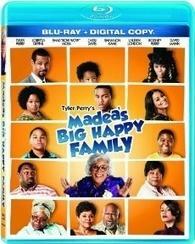 The gun-toting grandma with an attitude will be back in the latest Tyler Perry dramedy coming to Blu-ray this August. In an early announcement to retailers, Lionsgate says 'Madea's Big Happy Family' is coming to high-definition on August 30. Based on the stage play by the same name, the film stars the infamous matriarch as she once again puts a hilarious and inspirational twist on the family unit. Writer-director Tyler Perry ('For Colored Girls') stars as Madea, along with Shad "Bow Wow" Moss (HBO's "Entourage"), Loretta Devine ('For Colored Girls'), Cassi Davis (TV's "House of Payne") and other Perry fan favorites. Specs have yet to be revealed, but the release will include four featurettes and a digital copy. You can find the latest specs for 'Madea's Big Happy Family' linked from our Blu-ray Release Schedule, where it's indexed under August 30.